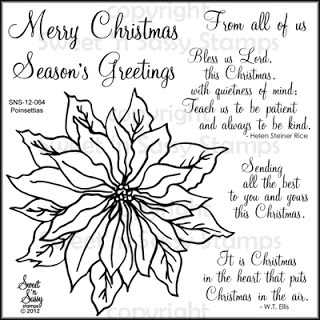 Hello friends and welcome to our Christmas in July die release and blog hop! We have two fabulous new dies to share with you that coordinate with two of our already popular Christmas stamp sets from last year---Poinsettia & Vintage Ornaments. Join us today as we share gorgeous samples feature these two sets with their matching dies and enter for a chance to win them! 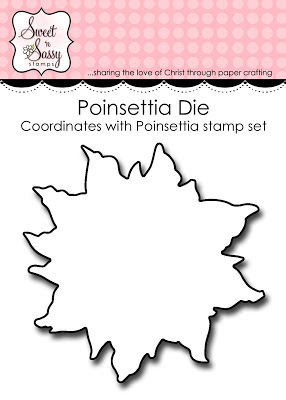 My first card features this beautiful poinsettia image, which is so easy to cut out now that we have the matching die! (And yes, I fussy cut that baby last year!!) I colored my image with Copics and added some text paper and this fun background design on the card base. 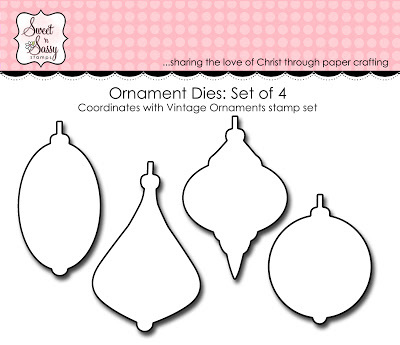 My second card showcases the beautiful ornament images included in the Vintage Ornaments stamp set. 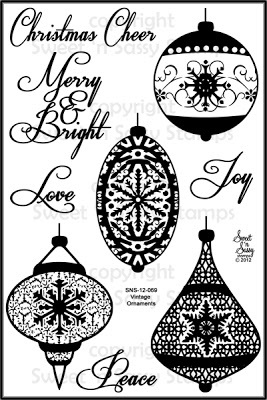 I stamped three images, using three different colors of Distress Ink, and then added a bit of Stickles bling! Then I just used some silver cording to "hang" the ornaments before combining three of the sentiments into one for my final saying! Now that you've seen the new dies, check out what our DT did with them by clicking the thumbnails below. The deadline to comment for a chance to win is midnight EST Wednesday, July 31st. The list of winners will be announced on our website homepage by Tuesday, August 6th. I have a post over on the Sweet 'n Sassy blog today...showing off this cute little fella!! Hop on over for all of the details! Enjoy! Welcome to day 5 of our July feature Blog Hops! 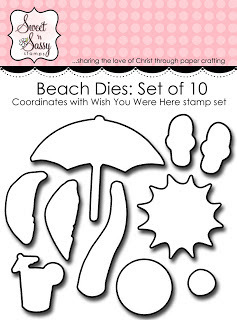 Today we're featuring the fun and fabulous new stamp set called Wish You Were Here with coordinating Beach Dies. Have you been having a great time on this week's hop!!!?? I love seeing all the wonderful projects...so much good stuff! And I adore this last stamp set and die set...Full of beachy fun! I confess that my first card was an idea that I found in a Paper Crafts magazine...It's suppose to look like a Polaroid but my cut out is a bit too huge! LOL! However, I sure do love the look of all those sweet die cuts! My background was created with Distress Inks and a blending tool and all of my dies were colored with Copics. My next card is just a fun clean and simple design, using the sweet coconut tree die. How about having your own little piece of beach paradise? Love it!! See below for more details on the set and die! The umbrella image measures approximately 2 3/8" x 2"
Be sure to leave a comment on each of the blogs along your journey because we're giving away this bundle to one lucky winner! The deadline to comment for a chance to win is midnight EST Friday, July 19th. The list of winners will be announced on our website homepage by Monday, July 22nd.